Acclaimed Movers and Storage has been in the business of providing luxury moving services for the better part of a decade. Whether the move is local or long distance, commercial or residential, we strive to provide the best possible experience to every customer, no matter how great or small the job may be. Since our founding nearly ten years ago, we have established our company as a front-runner in the moving industry, boasting an “A” rating with the Better Business Bureau, and we are a licensed and insured company registered with the Federal Motor Carrier Safety Administration. 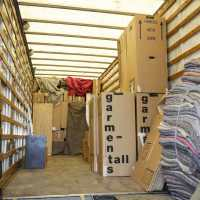 In addition to our expertise and moving services, Acclaimed Moving and Storage will provide all packing materials. This means there’s no obligation on the part of our customers to purchase boxes, packing tape, insulation, or moving materials of any kind. As part of a contract with Acclaimed, we provide our customers with top-quality, reinforced, state-of-the-art moving and packing materials. From durable moving boxes to thick insulation blankets, you can breathe easy knowing that your household goods are in careful hands. The only time you’ll have to lift a finger during your moving process is to give us that initial call; we will take care of the rest. Choosing Acclaimed Movers and Storage as your moving company means getting a higher, more refined quality than that of a national moving company, with the added benefit of local insight and knowledge. In selecting a smaller, community moving company, you’re signing of with a tight-knit team of locally-based employees who are well-trained and experienced in the moving industry. Acclaimed knows that there are rogue moving companies out there who try to lure customers in with the promise of a low price that they'll raise later when everything is loaded onto their trucks. Here at Acclaimed Movers and Storage, this will never be the case in doing business with us. We not only provide a free, no-obligation quote, but our trained, professional representatives will work with you to determine the price you want for the services you need. Our price is a "Not to Exceed" amount, so you can rest assured that you'll be well taken care of when you choose us for your move. We offer top quality, stress-free moving experiences, so call Acclaimed today and find out why we're considered the best in the moving business. We provide our own sturdy, durable packing materials. That means we provide all types of boxes to accommodate items of every shape and size. Our double wall dish packing boxes are top of the line and offer the best in safety during your move. Our movers are a team of full-time employees trained in-house in the art of packing and wrapping, the disassembly and reassembly of furniture, and the handling and transport of high-end items such as pianos and pool tables or bulky or oddly shaped furniture. Our movers know how to best pack every box to maximize the space available, as well as how to fortify the boxes so that they can support the greatest external pressure. This ensures the safety of everything packed inside. We have a fleet of eco-friendly trucks that run on bio-diesel fuel to minimize our carbon footprint and provide a "green" moving experience. Each truck is fitted with a GPS unit for to-the-minute updates during each move, which maximizes efficiency and eliminates that last day waiting game. It was so much easier using Acclaimed Movers and Storage when I found out that they provided moving boxes as well as other packing materials. All of which is included in the estimation they give you! No hidden fees! This not only made my move easier, but it made the move so much cheaper as well! The moving boxes they provided were more sturdy than the ones I was going to get, and held so much more! Thanks Acclaimed for the fantastic moving experience! Acclaimed Movers is the only place you can get cheap moving boxes that are worth anything. The boxes almost never break and are very sturdy, so you are able to carry alot more in them than other moving boxes. I don't know what kind of material your moving boxes are made out of, but you almost have to set them on fire or run them over to damage them. Way better than the moving boxes at Lowes or Home Depot.